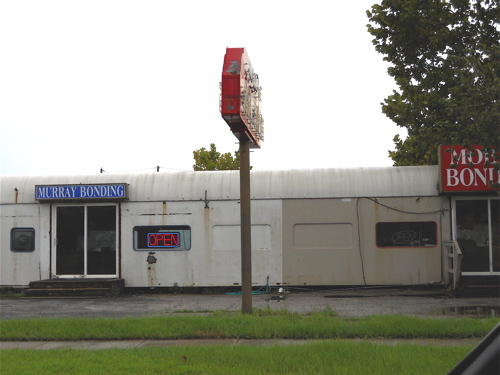 Bail Out Bail Bonds, across the street from the Mobile, Ala., city jail. Coming out of Biloxi, Miss., Ben “Ray” Williams, the former biker gang member turned bounty hunter at D & D Bail Bonds, informed me of a father and son team that ran a pair of shops in Mobile, Ala., who did good work. I started thinking about how the reality show could feature different teams of bounty hunters, that might interweave story lines so the show could change locations but continue a coherent story thread. This swing through Mobile and into the panhandle of Florida is the final leg of my reality television journey. My plan was to visit a specific group of bounty hunters in Mobile, check out the city, then head into Florida briefly. I had been gone from home for over a week now, and living on the road, while entertaining, was becoming a grind. Every day I had to chart a new town, find my path, dig up new contacts and be out of my hotel by 11 or noon at the latest. At which point luxuries like a desk were not available – I worked and lived out of my car. It’s fun for a while. The work is engaging, I love meeting new people and investigating different towns, but I felt I had found what the production company was looking for already. These bounty hunters fit the criteria. It was time to go home. Mobile is an old-world southern city. It began as the first capital of colonial French Louisiana back in 1702, and was colonized by France, Britain and Spain, whose influences remain present in Mobile. A cruise ship docks to pick up its new passengers before heading for the Caribbean. Located on Mobile bay, an hour from Biloxi, Miss. 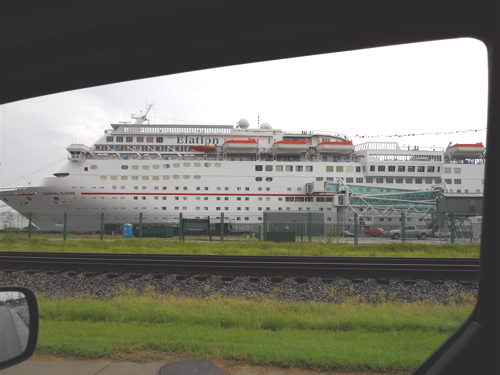 and two from New Orleans, Mobile serves as a vibrant shipping port and is an embarkation point for Carnival Cruise lines. With a population of nearly 200,000, this is far larger than my target city, but it feels smaller and offers a classic southern setting with an urban twist to offset the quieter confines of Gulfport and Biloxi. The downtown square is lined with trees and includes the requisite gazebo and park benches for lunch time eaters. Small businesses, law firms and a bank or two fill the outer ring around the green space. There’s a more locals-only part to the downtown area, some bars and restaurants that aren’t as easy to find and only allow those 21 and over to enter. Closer to the square is a more touristy section, where the university crowd goes to party. Mobile is very picturesque and accessible. Many of the streets share the same names as those in New Orleans. But this town also has a seedy underbelly, full of drugs, poverty and crime that city officials work diligently to hide. I came to see both. Bordering one side of the downtown area is the interstate exchange, which parallels Mobile Bay. The docks are over here, shipping repair and tucked neatly away off to the side is the city jail. This is not a pleasant looking establishment. I haven’t seen that much razor wire since the used car lots in SE Washington, DC. This is a nasty place and it’s evident they get plenty of business from the greater Mobile area. 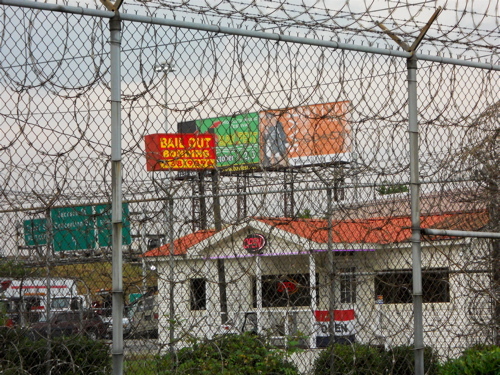 Outside the fence line, the jail’s perimeter is dotted with numerous bail bonding companies. Most people drive right past these often sullen and shoddy establishments, never giving them a moments consideration. An old rail car has been converted into two bail bonding shops. The majority of our population goes a lifetime without ever needing a bonding agent, but for those who live and work in this world they witness a core constitutional guarantee playing out every day – the right to freedom. Some never consider it because fronting money to get a loved one out of jail is a normal occurrence, while others are keenly aware of it. It’s no coincidence pawn shops are often located not far from bail bonding locations. Many times freedom comes down to money in the legal world. People will sell whatever they’ve got to pull together money for bail. Budget cuts in schools, lack of police on the streets, lack of prevention programs, poor economy, ill-conceived abstinence programs – what are only words and rhetoric in a politician’s sound bite get played out for real in cities like Mobile. A bonding agent is the immediate arbitrator between a person sitting in jail or being released. It’s only temporary, final arguments will go before a judge, but with the court system being slowed by overcrowding and bureaucracy, nobody chooses to wait in jail until their day in court. Usually 10 percent of the full bond amount is required in order to make bail. If that kind of cash can’t be pulled together it’s time to talk to a bondsman. It can be dead quiet inside a bail bonding office, or a cluster of activity; moms crying, money being pulled together by family members or friends, bonding agents switching hats to become fugitive recovery agents, bullet proof vests going on and weapons being loaded. Like law enforcement, bounty hunting can go from boring to deadly in a heartbeat. 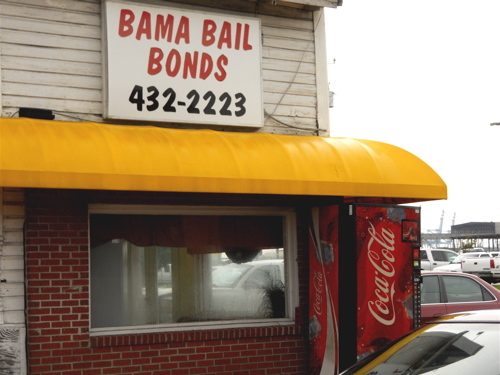 Bama Bail Bonds is conveniently located across the street from the city jail in Mobile. Directly across the street from the jail sits Bama Bail Bonds, right on the corner. 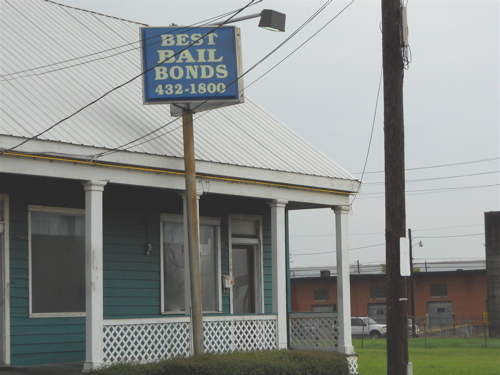 The guy I was looking for was next door at Best Bail Bonds – he runs both. There were a couple people hanging around in the shop, and a dog was sitting on the floor by the door. An animated figure was arguing tersely with someone on the phone. I was told he’d be with me in just a minute. Michael Breland appears rather average at first glance. He’s 5’8″, 180 pounds, with thinning hair and these intense bug eyes that stare out from behind thick lensed wire-framed glasses, turning yellow from age. Breland, 47, stood up and warmly greeted me. It was upon closer inspection that he became more intimidating. He was wearing a wife beater, with a winged tattoo extending out across his chest. Other tattoos were visible on his neck and down his arms. A heavy chain necklace, with a scorpion medallion hung around his neck. He had on a pair of jeans with a knife clipped in one pocket and a bottle of prescription pills sticking out of the other. We shook hands and I noted Breland’s huge sausage fingers attached to mangled hands that appeared to have been punching concrete walls his entire life. Michael isn’t overtly imposing, but he is convict scary. He has that look – like a guy in prison. He has to deal with those kind of people and handle violence up close and personal. He’s prison hard. Police officers sometime have this sort of feel because many of their clients are felons as well, but they also have to assist the public and direct traffic, responsibilities that help mellow their exterior. Bail bondsmen only deal with those who have been arrested, and must live and operate in that world, and think like fugitives think. These boys roll hard, tactical gear, sawed-off shotguns – they go where the police refuse to go. Breland and his crew use a lot of trickery to get the job done; fake voices, disguises, whatever is necessary to get into the house and make the apprehension. Something to remember is this type of work doesn’t always go the way it should. The commotion in Breland’s office when I arrived stemmed from an incident the night before. Two of his guys had gone to pick up a fugitive at a gated apartment complex, but they had been made as they drove up. A code was required to get through the automated gate, and the fugitive’s friends pulled a car up in front of the inside of the gate, and when Breland’s guys put in the code another car came up from behind and blocked in their car so they couldn’t move. Even though the fugitive recovery agents were armed, the bad guys got the drop on them, and they were robbed at gun point by four men. It could have been worse. Breland cautioned me that if we did use his crew for our reality television show, there would be many illegal deals going down within camera view, especially up in the Pritchard area, which is an African American neighborhood. A significant percentage of Breland’s overall clients and his fugitives come from Pritchard. It’s an area that has a lot of neighborhood bars, gay bars, strip clubs, and prostitutes (male and female). Best Bail Bonds is the other bonding company Michael Breland runs, and is located next door to Bama Bail Bonds. Between Bama and Best Bail Bonds, Breland averages 200 bonds per week, of which about 90 never show for court. So he and his crew have to go find them, week after week. There’s a large board in Michael’s office where he posts all the fugitives with they’re last known whereabouts. Typically they operate between New Orleans and Florida, that’s where most of their fugitives are found. But I noticed there was one name on the board last seen in Kentucky. Breland turned me onto three other hard dudes that work in surrounding states. My thought was if the show works and gets picked up, we could branch out and change locations. This way we would already have familiar people in several different cities. I also liked the hook that Breland had a son in the business with him. Chris, 26, works out of the same shop. He was out trailing a guy in Florida, so I didn’t get to meet him, but I’m told he’s a real bulldog. This entry was posted in Travel and tagged Bail Out Bail Bonds, Bama Bail Bonds, Michael Breland, Mobile. Bookmark the permalink.